The 17 minutes Queen spent on stage at Wembley Stadium during their Live Aid performance in July 1985 were 17 minutes which would both make rock history and transform the band for good. Though they'd enjoyed continued success with their platinum-selling 11th album The Works in 1984, as the mid-80s beckoned, frontman Freddie Mercury found himself disillusioned and searching for something new. The answer, it turned out, was Live Aid. A benefit show pulled together by Bob Geldof and Midge Ure in aid of the Ethiopian famine, the concert – dubbed by the organising parties as "the day music changed the world" – brought together some of rock's biggest stars over two venues in London and Philadelphia. In a day filled with memorable performances – here's looking at you, Led Zeppelin – Queen's Live Aid performance truly stole the show. The performance helped transform them into a wonderfully camp, sleek and ubiquitous rock band, and the biggest British live act of the 80s. That their Live Aid performance provides the start and end point of recent biopic Bohemian Rhapsody further illustrates the pivotal moment the band's remaining members feel it played in defining their career. Admittedly, a renaissance of sorts had begun with the videos for The Works singles Radio Ga-Ga and I Want To Break Free. But it was their performance at Live Aid, where they were the only band smart enough to work out how to play all of their hits in miniature, that bought them back big-time – even though they hadn't appeared on the Band Aid single, and they had incurred the wrath of Steve Van Zandt after they played in Sun City in apartheid-era South Africa. Freddieʼs long-term lover, Jim Hutton, had never been to a gig before Live Aid. 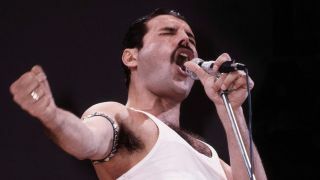 In his memoir Freddie And Me he described the aftermath of Queenʼs all-conquering Live Aid performance on that historic day at Wembley Stadium: “When he came off, he rushed to his trailer and I tottered behind like a puppy. His first words were: Thank God thatʼs over!ʼ Joe ripped his wet clothes from him and dressed him. Adrenalin still overflowing, Freddie knocked back a large vodka to calm himself. Then his face lit up. As we stepped out of the caravan we met a grinning Elton John. “You bastards…” he said to Freddie. Queen rotated around the stadiums of the world after Live Aid 1985. After their jaded years, they enjoyed an Indian summer of a career, having cemented their place as one of history's true great rock'n'roll bands.